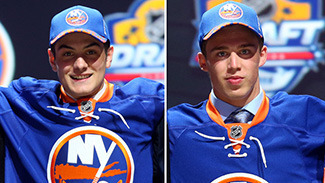 The New York Islanders didn’t have a first-round pick at the start of the 2015 NHL Draft, but things changed in a flash as General Manager Garth Snow executed two trades on the draft floor and selected forwards Mathew Barzal and Anthony Beauvillier at spots 16 and 28. Sometimes all you need is a good plan. Klatt and General Manager Garth Snow’s plan required patience, luck and well-timed aggression. The Islanders had an overstock of young, talented defensemen to potentially deal, but were only going to trade into the first round if the Islanders’ targets were available. Watching and waiting as the first 15 picks fell off the board, Snow and Klatt made their move at 16. It was bold, dealing 2012 first-round pick Griffin Reinhart to the Edmonton Oilers for the 16th and 33rd overall picks. The Islanders traded into the first round to select Mathew Barzal (left) and Anthony Beauvillier (right). The first pick became Barzal, an 18-year-old center from the Seattle Thunderbirds. Klatt, who had watched the Coquitlam, BC, native for three years, projected Barzal as a top-10 pick and was “baffled" that he dropped to the middle of the round. Klatt said Barzal, who had 57 points (12 goals, 45 assists) in 44 games, has elite skating ability and great hockey sense, but isn’t afraid to go into the corners or the front of the net – a trait Head Coach Jack Capuano loves in his players. Klatt praised his hands too, a nice compliment for a player whose favorite player is Patrick Kane and favorite Islander is John Tavares. Barzal was ecstatic when he found out he’d be joining Tavares and company. Before the ripples had fully dissipated from the Barzal splash, Klatt and Snow stunned the draft floor again late in the first round. Snow picked up the phone, dealt the 33rd and 72nd picks to the Tampa Bay Lightning for the 28th selection, and drafted Beauvillier. Beauvillier is coming off a sensational season for the Shawinigan Cataractes of the Quebec Major Junior Hockey League (QMJHL). He scored 42 goals and 94 points, leading the Cataractes in scoring by 30 points. The 18-year-old captained Team Cherry at the CHL Top Prospects game and came highly recommended by Klatt and co. The Islanders plan would not have come to fruition tonight without having the pieces in place to make moves. Using them well allowed the Islanders to get exactly what they wanted on draft night.